Playing Bingo at holiday parties has become a fun tradition for our family, and I had a lot of fun putting this Christmas Bingo set together. With the game being all images, it's easy for kids of all ages to play. 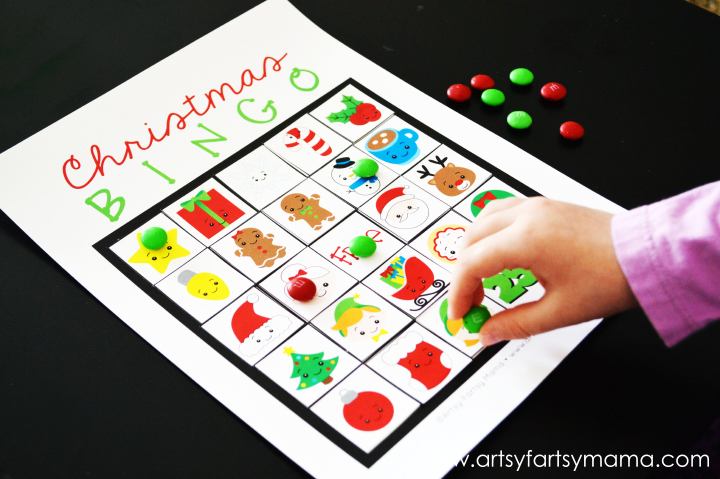 So go grab some Christmas candy, print out the Bingo sets, and get playing! Just like my Halloween Bingo, and Thanksgiving Bingo, I'm sure this version will be a hit to play at a school Thanksgiving party. Since my daughter isn't in school, we've been having a wonderful time playing as a homeschool activity. It has been a great way to learn new Christmas-themed vocabulary and to practice matching. 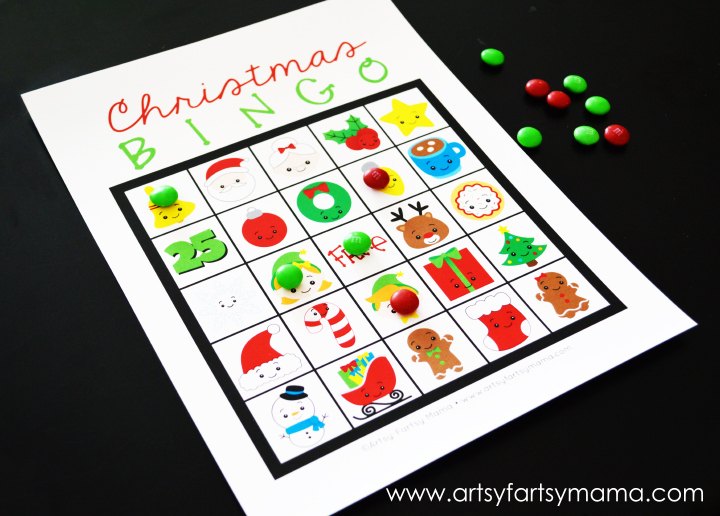 Print out the DIY Christmas Bingo Set, which comes with a blank card (with the "free" space already added), all 24 Bingo pieces, and the calling cards. Print out the cards on cardstock, and the Bingo pieces on cardstock or regular copy paper. This is really cute and a great idea. I think I will print these out and we can play at our Christmas dinner. Then maybe all of the talk won't be the hunting stories that the men have told each other every single Christmas and Thanksgiving for 25 years. I don't know why they do that. They were all there. Thank you for creating these! I printed the Thanksgiving set and my son loved it! I told him I would watch for a Christmas one and as soon as I saw the email this morning I showed him and he was so excited! We look forward to playing this all through Christmas and look forward to many more versions in the future! I don't have a laminator so I decided to place them in sheet protectors and keep them in a binder and it has worked great so far. I placed the game pieces in an envelope and labeled it and then used a circle punch I had to make game pieces with card stock that we keep in the binder as well. Thanks again for making these! We love them! I love your bingo things. Gonna print this out today so I don't forget like on Thanksgiving! This bingo set is adorable! I just made one and posted it on my little blog...but yours is so much better! Hahaha! Thanks so much for sharing! Cute... I am pinning! Thank you so much for linking up with The Party Bunch.